active since January, 17, 2010. We wish all our friends and customers a peaceful festive season and a happy and prosperous new year! 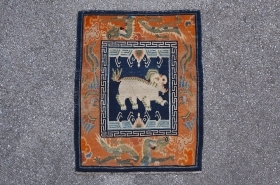 Ivory coloured Beijing rug, circa 1920. Repiled areas. Great shabby chic character full or charm. 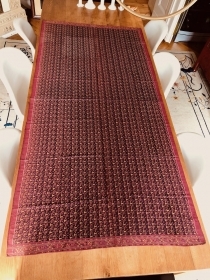 350x270 cm. 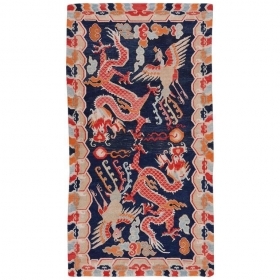 Elegant Chinese 5 dragon rug. 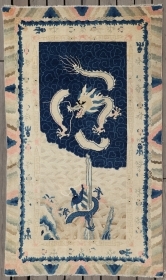 5-clawed dragons and wave and cloud border. Good condition, see images. Circa 1920. 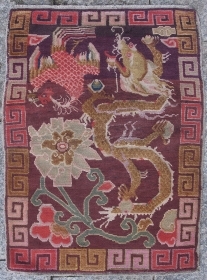 215x128cm. 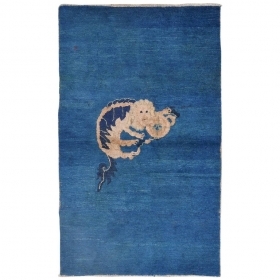 This quirky Tibetan sitting or saddle top rug (Khagangma) shows a unique combination of colour and expressive design. Circa 1920. 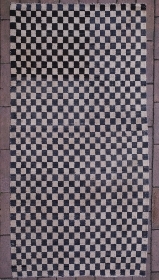 82x60cm. 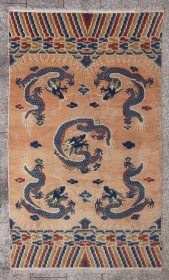 Lovely Tibetan two dragon and phoenix khaden. Beautiful colours. Wear consistent with age. Circa 1900. 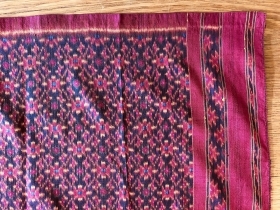 153x70 cm. 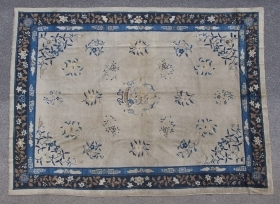 Antique Cambodian ikat silk samphot. 1st quarter 20th century. Lovely piece in great condition. 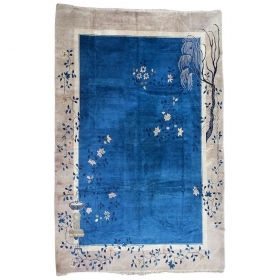 180x84cm. 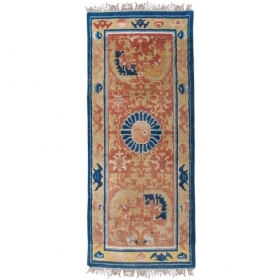 Antique Ningxia runner with yin-yang medallion and fo-dogs. Part of a long temple runner, hence bothe ends replaced. 19th century. 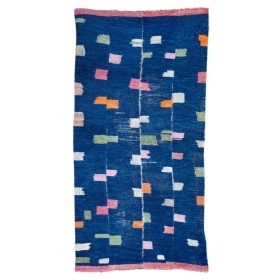 170x70cm. 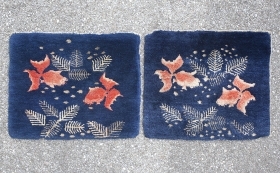 Lovely pair of Inner Mongolian seat maps. Warm red with blue peonies. 41*32 cm. 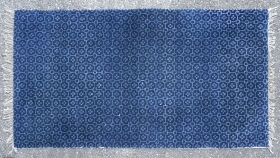 Lovely Baotou lattice pattern fragment. Early 20th century. 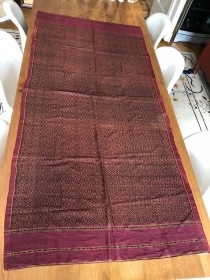 60*110 cm. 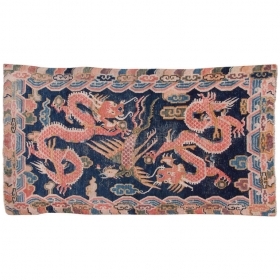 Antique Chinese dragon throne cover. 5 dragons on a yellow background. Great condition only the red has slightly run. 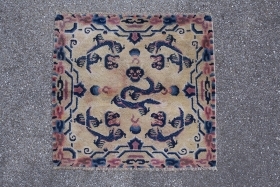 66*70cm. 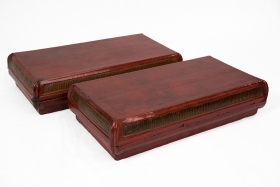 Lovely Baotou throne seat back. 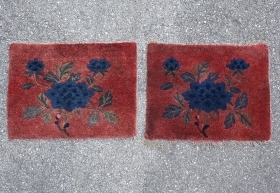 Depiction of flowers and lingzhi. 1st quarter 20th century. Good pile small restorations. 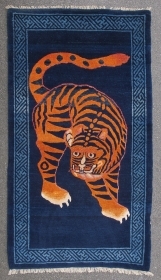 72*63 cm. 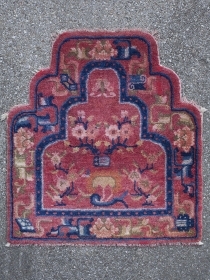 Lovely Tibetan sitting rug or saddle top. Warm red tone. 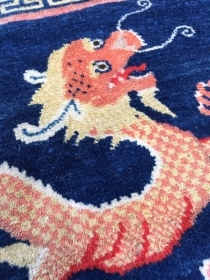 Very subtle medallion pattern. Great condition. 1st quarter 20th century. 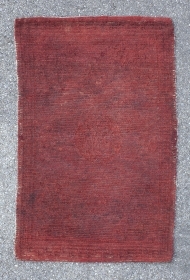 83*54 cm. price: € 220 plus shipping.